With the rapid progression in CPU designs meaning that multithreading is now default on most high end CPU’s, video editors are most often constrained by the speed at which data could be fed to the CPU. The source of which is either from online memory (RAM), or from the hard drives. Given that the client shoots footage in high definition professional quality formats, the file sizes that require editing are often considerable. As such, simply maxing out on high speed RAM and ignoring hard drive access speeds will most likely not provide the optimal solution. The component cost amounted to R21,000, i.e. R1,000 over the client’s original budget. The primary reason for exceeding the budget was a desired increase in system memory from 6GB to 12GB. Additionally, the initial quote called for the use of an ASUS P6T6 Revolution motherboard, but that board reached an end of life before the order was placed and was replaced with the P6T7 which is almost a R1000 more expensive. The reason for me wanting to use a workstation board originally was due to the fact that these motherboards came with integrated SAS drive support, but lacking native USB3.0 capability. My supplier did not have any of these motherboards, nor any USB3.0 controllers, so I opted instead to drop the workstation board and rather invest in a dedicated SAS controller and a motherboard with on-board USB3.0 support. From a financial perspective, this worked out to more or less the same as the original quotation but I believe the latter solution is the better one since the client can easily add two further SAS drives to the PC without needing to worry about the controller (unless he decided to go with SAS enclosures, which is a different animal all together). The CPU is I7-950 CPU, not much more is needed to say about it. 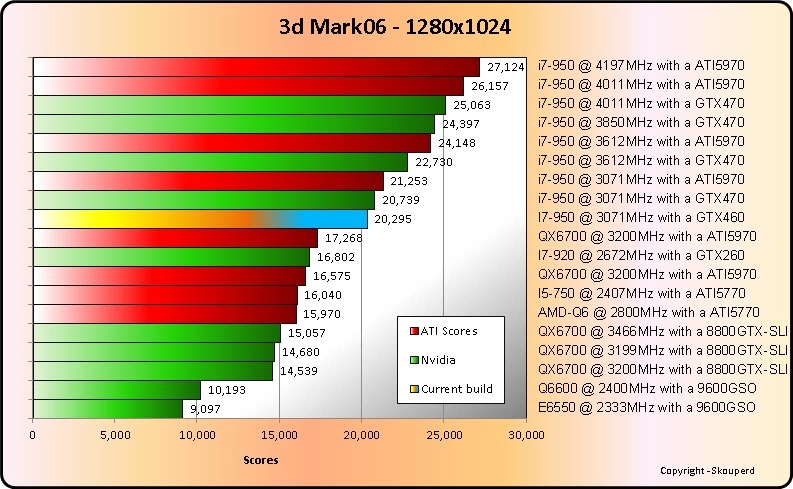 Despite the I7 being replaced by Sandy Bridge, right now, bang for buck there is very little that can touch this CPU. As has been seen in my previous mega build entitled “Rampage III Gene, i7-950@4Ghz and a GTX470 build”, this CPU overclocks very nicely and only asks for a little help in the cooling department. Apart from the overclocking capabilities this CPU is now known for, the best part must be the fact that it is based on the now time tested X58 platform. This combination of CPU and Chipset are equally at home in a high performance gaming PC as they are in a workstation environment. The motherboard is the first Sabertooth edition board that I’ve had the opportunity to work with, I was very satisfied with the general layout of the board and the colour scheme is a nice break away from the current standards. The only criticism that I do have is that the heat sinks don’t appear to be quite the same quality as what the ROG boards have. Then again, this board costs only 60% of what a similar ROG board does. The biggest issue I have with this board is the lack of a breakout USB3.0 port. That means the only way to have access to the USB3.0 ports is from the back. I would have liked to have a USB3.0 connector on the front since it just makes more sense. The motherboard have three PCI-e x16 slots, two of which are 2.0 standard, two PCI-e x1 and a single PCI slot completes this board. Something to be aware of when considering this motherboard, is that the PCI slot will be covered by a dual slot graphics card. Despite losing a PCI slot, this still leaves us with a fair number of PCI-e slots to use. Most new add on cards are PCI-express in any event, so this shouldn’t prove to be an issue with most new PC builds. The only people who are likely to have a problem with this are those who have legacy add-in Sound Cards that use the PCI format. The back panel is reasonably packed, with all the important stuff sitting where it should. The one thing that we are lacking here is a breakout sound card which has become the de facto standard for high end gaming boards. The memory, well, 12GB of memory sure looks good. I did not opt for the super expensive modules given that we will not be overclocking the system. Despite having mediocre heat sinks, these guys are still capable of 1600MHz at a latency of 9-9-9-18. DDR3 memory prices have come down nicely over the last 12 months thereby making these chips an easy choice for this built. I mean, come on, just look at her, wearing that nice tight fitting blue number... Sorry, where was I? Oh, unpacking the graphics card. As I’ve said, no matter how many of these I open up, I am like a little kid on Christmas eve. Included in the box with this graphics card, apart from the normal boring stuff needed to make it work, is also a nice leather pouch for storing CD’s. Normally, when you upgrade a graphics card, people don’t care about things like that. However, building a complete system allows me now a place to store (and hand over) all the drivers and CD’s for the computer into something that looks a tad bit more professional than just chucking them into a box. The only concern I had with the graphics card was that at stock settings the heat pipes got way too hot for me to feel comfortable with. However, manually adjusting the fan to slightly more aggressive speed timings sorted that problem. Although everything that we’ve covered so far is very nice, the main components of this system are without a doubt the hard drives. The solution we opted for was to have a very quick operating system drive, a superfast working drive, and a reasonably amount of backup space. What I opted for was a 60GB SSD Corsair Nova drive for the operating system, two dedicated high speed 15,000 RPM SAS drives in a RAID 0 configuration for the working drive, and a 1.5TB normal drive for storage and backups. The intention is to add another 1.5TB drive in future and create a RAID1 array for the backups. If the working drive needs an extra boost in the performance department, we can easily add on two more Cheetahs. The operating drive produced some stunning results. The difference between a SAS connection and a SATA connection is minute. Just note the gap that is evident on the SATA drives whereas on the SAS drive it appears as a solid bar. While normal SATA drives do. There is technically no reason for why you need a different cable for a SAS drive versus a SATA drive as long as your controller is capable to deal with SAS drives. So, instead of spending a lot of money to buy a Mini-SAS to 4 SAS fan out cable, one could “modify” the existing SATA fan out cable a little bit. The way to do it (apart from being very carefully!!) is to take a very sharp knife or side cutter and just cut-off the side of the SATA connector without touching the pins. Do the same on the power connector and you are sorted. This then allows you to plug in the supplied SATA fan out cable, and a normal SATA power connector into a SAS drive. I had the good fortune to be able to hone my skills on various old cables, not to mention sharpening my knife thoroughly before attempting it on the client’s cables. Obviously, the solution work, as we can see in this build, but if you try this at home you do it at your own risk. So, now that we have the connectors sorted and SAS friendly, we can start playing with the two SAS drives. The power supply, a Corsair HX750w comes with modular cable management. The more I work with the Corsair power supplies, the more I like them. They are a tad bit more expensive than the norm, but the built quality is really good. The cable lengths were adequate even for bottom mounting the PSU. The case is a Coolermaster RC-692-KWN. I’ve used a number of Coolermaster cases on my recent builds and they seem to offer reasonable value for money. The overall build of the case is sturdy enough, and the overall layout respectable. I like the fact that this case isn’t as cramped as many other similar priced cases with sufficient space around the edges of the motherboard to allow neat cable management. It appears as if Coolermaster have read my review on the RC-690 and they have now allowed about 1cm additional spacing in the back of the case (behind the motherboard tray) for easy cable management. Not only did they increase the space at the back of the panel, they also carefully considered exactly where to cut the holes for the cables. This is one of the few cases that made back channelling of the cables a pleasure to work with. The airflow in the case was also very good thanks to fully perforated front and top panels. Again, I am just a little nervous that in time those holes will get clogged up by dust and of course the fatal possibilities of somebody spilling a drink over the case (you never know what will happen at a LAN party). In my mind, the main difference between a custom build and a factory build is the amount of time that goes into making it look good. This build took me the better part of four hours to assemble but I am happy with the end result. However, despite all the complements on the ease of using the back of the case for cable management, it still looks ugly. Fortunately, the PC’s side window only looks in on the front. Given the neutral colour of the motherboard and no really dominating colour on the graphics card either, I’ve opted to go with black cable ties throughout. Unlike other builds where one wants to highlight a specific colour tone, this case would have looked odd with another colour of cable ties. The following is a summary of the benchmarks that I’ve run over the years on systems like these that I’ve built. I apologise that it is not as good looking or as complete as that of TomsHardware, or Anandtech, but I like them, and since I am writing this article, I am including them. The main difference between the GTX460 scoring 20,295 and the GTX470 both running the same CPU clock speed, is that the memory on the GTX460 system was slightly faster. This system, all stock settings barring the memory running at 1600MHz, gives both AMD and Intel CPU overclocked systems with proper gaming graphics cards, a good run for their money and slots in exactly where it should. I would have enjoyed adding a water cooler on this CPU in order to see what a GTX460 is really capable off, however due to the workstation nature of the PC, stability needs to trump graphics benchmarks on this build. It is a real pity that I have so few data points on proper RAID controllers. The above sketches a very unfair comparison since the only real hard drives that I have available that is any form of comparison to the speed observed on the Adaptec 1405 is my file server that hosts a PERC H700 Dell controller. Attached to this H700 controller are two arrays, each array containing four 1.5TB drives. I then went further and RAID0 a small portion of those two arrays in the operating system, giving you effectively 8 drives, which has been short stroked, in a RAID0 configuration. The net result is just stupendous sequential read speeds. The results are further skewed in that the H700 have 512MB of RAM, shall we increase the file size to 4GB to eliminate the RAM, then the speed drop to only about 900MB/s sequential reads. Before anybody comment, yes I know it is stupid to put 8 drives into a RAID0 configuration, but this array host all my ISO’s and I had a single minded objective with that array, achieve maximum throughputs! Either way, compared to a standard hard drive, the Adaptec 1405 paired with two SAS 15,000 RPM drives are no slouch. Should speed ever become an issue, then one could easily throw a couple of more SAS drives into the RAID array and effectively increase the speed again. Overall, this is a very nice system, well balanced in both the graphics performance area and the speed on the hard drives. The dedicated Adaptec SAS controller allows for a reasonable upgrade path to add in more SAS drives as speed and space is needed. This system could easily change its colours and become a gaming rig for a weekend LAN only to go back to being a work horse the following week (once the beer has been drained out of the vented roof). Ps. all photos were taken by me, so if there are any serious photographers here, let me know how I could improve future shots, since most of them still look a bit amateurish to me. PPs, Jonno, how is she performing?